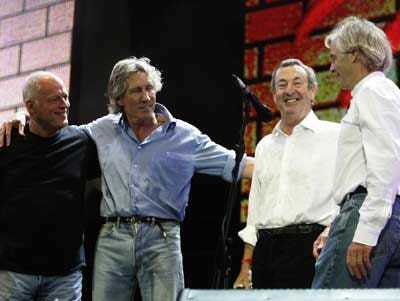 Even Pink Floyd can’t pull EMI out of debt. Music publishers are in trouble — no news there — but EMI Music Group is especially challenged right now.The once-unstoppable British company, which owns rights to The Beatles, OK Go and Pink Floyd (though the band has been trying to wrestle control back), is at risk of defaulting on debt unless it can get its hands on some quick cash. EMI’s solution: Ink an agreement with one of its largest competitors to licence its catalogue and potentially shut down the majority of its U.S. operations. WSJ: People familiar with the matter said that EMI needs to get any licensing deal done by Wednesday, in order to help it satisfy a so-called covenant test showing whether EMI’s finances conform with the requirements of a loan agreement with Citigroup Inc. A cash advance from a licensing deal would help EMI meet the test. But so far, no one wants to get in bed with EMI, at least in part because they don’t want to piss off Citigroup. Vivendi Music Group halted talks last week, Sony Music is reportedly ending negotiations and Warner never even started talks. WSJ: EMI is the collateral on the £3 billion [$4.5 billion] package of loans written by the banking giant. A deal that would involve scaling back its U.S. operations could sharply reduce EMI’s value. If a deal looked imminent, Citigroup could take steps to try to block it. If the company can’t land a deal, EMI’s private equity owner Terra Firma will default on payments to Citigroup, which could then take hold of the company and sell it off in pieces. Terra Firma bought EMI in 2007 for $3.6 billion.